Are you a researcher who relies on public transportation to get to Archives II? This notice is for you! Metro Surge #14 will close the College Park station from April 15-29. 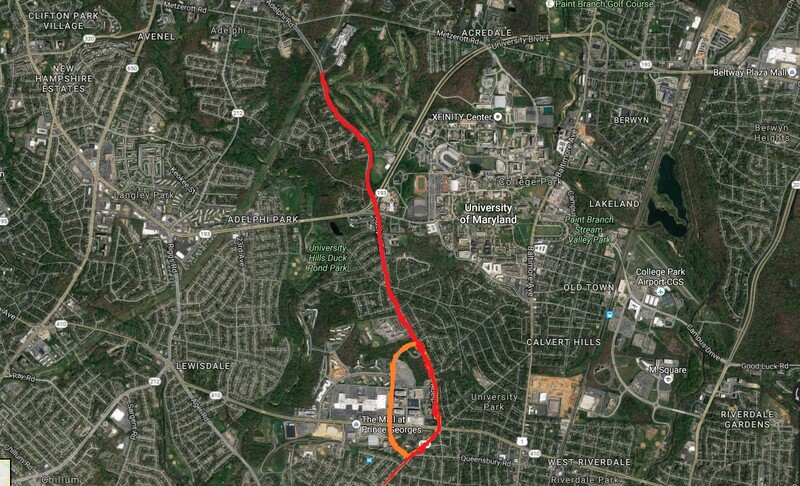 The C-8 bus line runs out of the College Park station and is the only line that services Archives II. During this time, NARA will operate additional shuttle runs between Archives II and the Prince George's Plaza station weekday mornings for the time the College Park Station is closed. The first shuttle will depart Prince George's Plaza for Archives II at 6:45 a.m., and again every 30 minutes until 9:15 a.m. There will also be an additional, final evening shuttle from Archives II to Prince George's Plaza leaving Archives II at 6:00 p.m. Please see the below map for shuttle pick-up location. 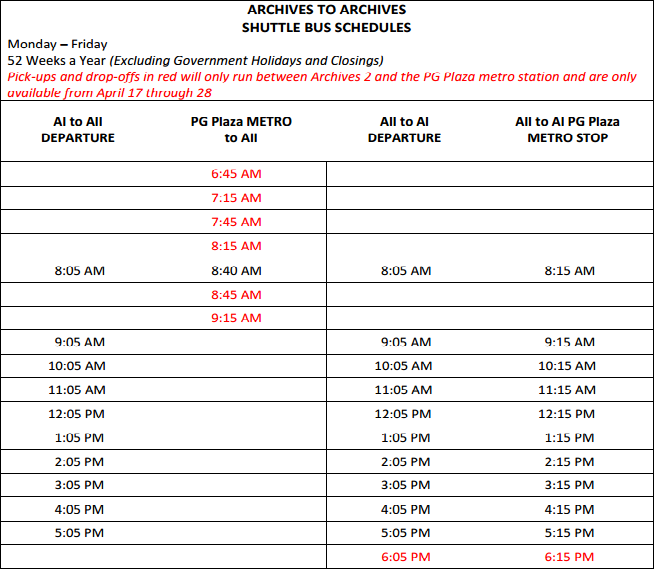 Additionally, the normal shuttle bus departing Archives II will stop at Prince George's Plaza on its way to Archives I at any point during the day. Please tell the shuttle bus driver if you need to be dropped off at Prince George's Plaza. If you have any questions or concerns, please contact Facility and Property Management Director Mark Sprouse at mark.sprouse@nara.gov or x73019. If you are planning on conducting research in our Washington, D.C. area or St. Louis facilities, this pilot may affect you! The National Archives and Records Administration is announcing a biodegradable nitrile gloves pilot program in AI, AII, and St. Louis research rooms, beginning April 3, 2017. The pilot will last for 60 days. NARA conservation staff are studying the advantages of using nitrile gloves in place of cotton gloves by researchers and staff. Nitrile gloves provide several advantages that protect the records during handling by improving tactile sensitivity and eliminating lint residue on records and images. Unlike cotton gloves, nitrile gloves do not allow moisture to seep onto records. Researchers will only use the nitrile gloves when handling records for which NARA already requires gloves be used. Researchers handling loose photographic materials not housed in plastic protective enclosures (with the exception of the Still Pictures Research Room, College Park, where disposable gloves are always worn) including photographic prints, negatives, slides and transparencies, lantern slides, cased photographs, photo albums, all film reels (including aerial, motion picture, microfilm), microfiche, three-dimensional metal objects or any other artifacts, are required to wear disposable gloves supplied by NARA. Nitrile gloves will be distributed at a self-service station located at the research room monitoring desk. Research room staff will assist researchers in the use of the disposable nitrile glove sizing chart. If needed, on a case by case basis, cotton gloves may be provided to researchers with a sensitivity to nitrile. Researchers will be required to dispose of used gloves at the monitor station when finished wearing the gloves or when exiting the research room. Do you take the (free) shuttle between Archives I and Archives II, but wish it worked better with your commute? Take note of the trial stop addition to the shuttle's route! Beginning January 30, the hourly shuttle between Archives I and II will add a stop near the Prince George's Plaza Metro station. The Archives I to Archives II shuttle will pick up riders from the Prince George's Plaza Metro once per day. The shuttle from Archives I will stop at Prince George's Plaza at approximately 8:40 a.m. and continue to Archives II. The Archives II to Archives I shuttle will drop off riders at Prince George's Plaza on every run. The shuttle from Archives II will stop at Prince George's Plaza hourly from 8:15 a.m. to 5:15 p.m.
Shuttles in both directions will stop along Belcrest Road, near the intersection with the East-West Highway. 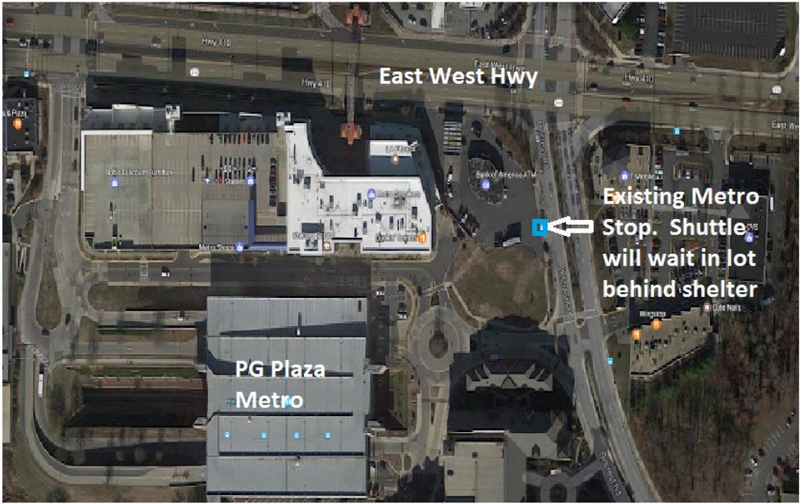 Pick-up/drop-off points are a short walk from the Prince George's Plaza Metro station (see figures below). NARA is adding the Prince George's Plaza stop as a 90-day trial. We are testing the additional stop to determine whether it is a useful replacement for the R3 bus route that WMATA recently cancelled. After 90 days, we will determine whether to continue this stop. To this end, drivers will track ridership to and from the Prince George's Plaza stop. When you get on the shuttle, please inform the driver that you need to get off at the Prince George's Plaza Metro Station. A sign will be displayed above the driver to remind passengers. If you have any questions or would like more information, please contact Chief of Facilities and Property Don Overfelt at 301-837-3712or donald.overfelt@nara.gov. Figure 1: The current route is in RED and the trial change is in ORANGE. 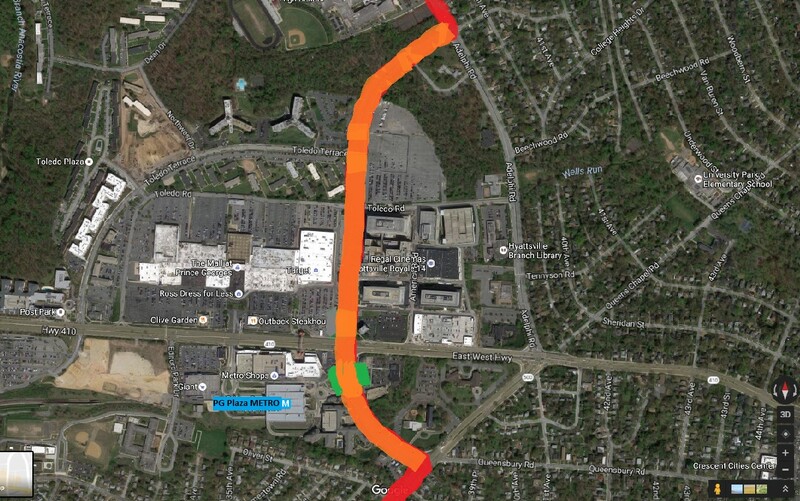 Figure 2: Trial change in ORANGE and additional shuttle drop-off/pick-up points in GREEN. Textual Research Room at Archives II Fully Re-Opened! The National Archives has fully re-opened the main textual research room at Archives II in College Park, MD! The re-cabling project has been successfully completed and researchers now have full access to all copiers and scanners, public access computers, and card kiosks in the research room. All authorized equipment is allowed into the research space, and all tables have full power to their outlets. Please note: Reference consultation staff has also returned to the main textual research room on the second floor. Researchers working with textual materials will meet with reference staff, submit pull slips, and view requested materials in the second floor research room. The National Archives will partially reopen the second-floor main textual research room at College Park, Maryland, on Tuesday January 17 (two days earlier than previously projected). Researchers will have full access to the second-floor main textual research room and will be allowed to bring and use all authorized equipment (including scanners!). All tables will have full power to their outlets. However, our reference consultation staff will still be located in the third-floor library until further notice. While textual records will be brought to researchers to view on the second floor, researchers will continue to submit all pull slips in the third floor library. Pull times will return to normal: 10 a.m., 11 a.m., 1 p.m., 2 p.m., and 3 p.m.
We are working with our contractors to bring all technical systems up as quickly as possible. On January 17 we will have full power, and most of the copiers and scanners and the kiosk in the copy center (used to add funds to your copy card) will be available. However, the public access computers and the front entrance kiosk may not be operational until January 19. Textual Research Room Closure at Archives II Extended! Planning a research trip to Archives II in College Park, MD? The temporary closure of the Textual Research Room may affect you! Due to unforeseen issues with the re-cabling project, the National Archives is projecting a tentative reopen date for the second floor main textual research room at College Park, Maryland, of January 19, 2017. Please also note that ALL RESEARCH ROOMS will be closed on Saturday, January 7, 2017 in support of the project. We are making every effort to reopen the research room before January 19 and we will provide status updates through posted notices, our web page, and social media. NARA will continue to provide limited alternate research accommodations for those wishing to review textual records. Please see the main research room closure FAQ on the NARA web page for more information regarding alternate research procedures for textual records. We regret any inconvenience and appreciate your support. Special Media Research Rooms* in Archives II at College Park, Maryland, will remain open during normal business hours (except when closed on January 7). Research rooms at Archives I will be open during normal business hours. On-line access to NARA holdings will also still be available 24 hours a day via www.archives.gov/research. *Special Media includes Cartographic, Motion Picture, Microfilm, and Still Picture research rooms. Planning a research trip to Archives II in College Park, MD? The temporary closure of the Textual Research Room from December 28, 2016 - January 4, 2017 may affect you! If you haven’t been checking our Facebook page or the main Archives.gov page (and why aren’t you? ), there are some changes coming to Archives II in College Park, MD, this winter! From December 28, 2016 through January 4, 2017, Archives II will continue its re-cabling project, this time in the main Textual Research Room on the second floor of the College Park, MD facility (Room 2000). Due to construction hazards, that room will need to be closed for the duration of the project (and possibly for slightly longer than scheduled), BUT we will be providing researchers with alternative Textual Research spaces while the main Research Room is closed. These will be on a limited basis, owing to size and space restraints. This closure will ONLY affect the main Textual Research Room at Archives II. This closure will not affect the Special Media Research Rooms at Archives II, or any of the Research Rooms at Archives I in Washington, D.C.
We ask for your patience and understanding while we work to upgrade our services. Watch this space for more information! The original notice can be found here. There are many ways to do research at the National Archives from the comfort of your own computer! Whether from home or on one of the National Archives public access computers, we have a large (and increasing!) number of resources available to help with your research. By conducting a basic search and selecting the ‘Available Online’ tab at the top of the results display. By using the advanced search option, and selecting only the ‘Archival Materials Online’ box at the top of the display. You can also visit the Archives Library Information Center (ALIC). ALIC is physically located in our College Park building and is ‘designed to provide NARA staff and researchers nationwide with convenient access to content beyond the physical holdings.’ ALIC provides access to resources related to American history and government, archival administration, information management, and government documents. We work with companies, such as Ancestry, Family Search, and Fold3, to digitize and upload some of our holdings. These are free to access from our Public Access computers at the National Archives DC and College Park sites, regional branches, and Presidential libraries. Although, there may be a fee to see some documents outside of the National Archives. A complete list of our online databases, and where you can access them, is available here. If you are working with Microfilm, you can also look in our Microfilm Catalog (by publication number) to see which National Archives site holds the publication you are looking for. The Catalog will also show you if the publication series has a descriptive pamphlet for you to use (and download). Further, several of the older Microfilm Publications (usually of pre-1850s records) may have been compiled into published collections, which will usually be noted in the descriptive pamphlet. Some of these, such as the Naval documents related to the quasi-war between the United States and France, 1797-1801, have been digitized by various organizations. The site, HathiTrust, may well be worth a quick check! A complete list of our online research tools is available here. Looking at one (or more) of these digital resources may help you fine tune your research needs before you visit the National Archives in person or even lead you to an unexpected discovery. If you need further information or encounter an issue, the National Archives contact portal is here, or stop into your local NARA branch. Good luck! #ResearcherProTip- So, What’s the Difference Between a Library and an Archives? In the research rooms we often see a lot of frustration from first-time visitors when their expectations don’t line up with the setup here at NARA. They want to know why we don’t have multiple copies of popular records, or why it’s so hard to find the specific document they’re interested in, or why there are so many rules about how to handle documents. This frustration often stems from a lack of understanding about the differences between a library (something with which almost all of us have experience) and an archives (which may be less familiar). So, what are the differences between the two? The greatest underlying differences are in the types of materials libraries and archives collect, and the way they provide access to those materials. A library collects information resources (like books, periodicals, electronic databases, and multimedia items), and organizes them so that patrons can easily find and use them. Libraries circulate materials, often have similar collections across institutions, usually collect multiple copies of popular items, and can replace worn out items relatively easily. An archives also collects information resources, but they are usually primary source materials that are unpublished and almost always unique, meaning that they cannot be easily replaced if damaged, lost, or destroyed. Primary sources are the original items we study to learn about our history, such as photographs of people or events, correspondents between individuals, or the records of a government agency. Because each archives collects unique materials, preserving those materials is important. Handling guidelines, such as wearing gloves when touching photographs, using support pillows under bound volumes, and not using flash when taking photographs, all help preserve materials for future use. Finding and accessing a specific item in an archives is especially tricky. In a library, it is quite easy to search the catalog for a book by its title, discover its location in the library, and then go to the shelf to retrieve it. In an archives, materials are held in closed stacks, meaning researchers cannot find and retrieve them independently. Archival collections are usually established by grouping together all the materials created by a particular person, family, or organization. These groupings, called “record groups” here at NARA, can contain hundreds of boxes, thousands of reels of film, or just a few volumes. Because most collections contain too much material for each item to be individually described in the online catalog, each collections is described as a single entity, with an outline specifying the different sections of the collection (called “series”) and any subjects or individuals that are noteworthy in the collection. Here at the National Archives, the National Archives Catalog and analog finding aids describe the organizational system of record groups and series, and our reference staff works hard to give researchers as much information as possible to help guide their work. Are you gearing up for a research visit? Check out our website for more information on navigating our collections. #ResearcherProTip is a blog series written by the research room staff of the Archives II in College Park, MD. Have a question about the research process you’d like answered? Leave a comment below! With over 2 million cubic feet of records at College Park alone, coming to do research with only a name or a topic just isn't enough. Before making a trip out to a NARA facility, do at least a basic search of the catalog or maybe ask on History Hub to get an idea of where to start. If you do find something in the catalog that you are interested in seeing, print out the whole entry. That will save time once you get to the archives. Otherwise, a reference archivist will need to re-search for the records you’re interested in. time and money, see if it makes more sense to work through an intermediary. Some simple requests can be handled by requests to NARA reference staff. Professional researchers can also be hired to do research on your behalf. If a NARA facility is open on a weekend, services are usually limited. For instance, here at College Park, there are no pulls, limited finding aid assistance, and (most importantly) the cafeteria is closed. If you’re planning to do research on a weekend, call the archival facility to see what will be available during your visit. Just because records are stored at the National Archives doesn’t mean they’ll be available for a researcher to look at. The records you’re interested in could be checked out to another researcher. They could be part of a digitization project or they may have to be requested through the lengthy FOIA process. They might be damaged and undergoing conservation work. No matter the topic, researchers need to plan for what they’ll do if they can’t see the records they’re interested in. 5. They don’t keep track of what they’ve looked at. NARA keeps track of record pull requests entirely on paper. While this has some advantages (paper never has “network connectivity issues”), once a pull is returned to the stacks, the paperwork is sent off to long term storage pretty much never to be seen again. If you need to know what you’ve requested on the past, it’s the researcher’s responsibility to keep track of that information. Did you know that NARA has rules about what kinds of equipment researchers can use? It turns out, there are a lot of them! Printers, wand scanners or scanners with an auto-feed option, certain camera and tablet stands, and equipment with external light sources are all banned. If you aren’t sure about your equipment, contact the NARA branch and ask before you come!